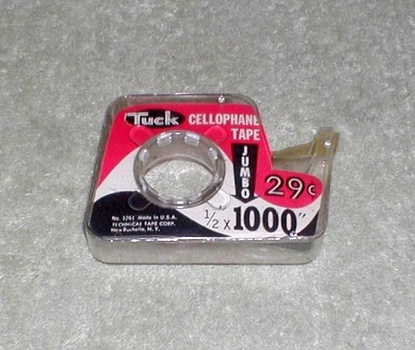 This is a circa 1950's Tuck brand cellophane tape roll in its "snail" clear plastic dispenser. This is a 1/2" X 1000" jumbo roll (product no. 1261) with the price marked on the inner paper label as 29¢. It still contains about half the roll but it has yellowed and the adhesive has deteriorated. Tuck brand cellophane tape was manufactured by the Technical Tape Corp., New Rochelle, NY. - The company was founded in 1947 and dissolved in 1988.